Picture 500,000 people strolling, dancing in wooden shoes and taking in the sight of 5 million tulips blooming throughout the city. Perhaps Holland’s greatest claim to fame is the Tulip Time Festival, which is commemorating its 90th anniversary in 2019. This huge celebration will be held May 4-12 and, as always, promises to be an amazing experience. Heralded as the nation’s “Best Flower Festival,” “America’s Best Small Town Festival,” and even the "Tulip Festival of the Year” in 2017 and 2018, the Tulip Festival is billed as having “three parades, hundreds of Dutch dancers, national and local entertainment, dinner shows, a Dutch market, fireworks,” and, of course, tulips. The anniversary color is orange, so orange tulips of all varieties will be in bloom to celebrate the occasion. Your group can even prearrange your attendance at ticketed shows and parades, and sign up for tours. In keeping with the Dutch tradition that permeates the entire town, there are several sights to see that may not be found anywhere else (except the actual country of Holland, perhaps). A truly whimsical sight is the real Dutch windmill, DeZwaan, the only one of its kind operating in the United States. As a genuine, working windmill, it grinds locally grown wheat into flour under the watchful eye of a certified miller. Tours are conducted by authentically garbed guides who explain the windmill and its process. From the fourth floor of the windmill, the view includes 36 beautifully gardened acres, including some dikes and canals. DeZwaan is located in Windmill Island Garden, which also includes an authentic Amsterdam street organ, a beautiful hand-painted Dutch carousel, a playground and picnic areas, the flags of the Netherlands, pastures, a Dutch Inn replica, and more. Another authentically Dutch attraction is Nelis’ Dutch Village, a replica of a Dutch village from the 1800s with all the trappings, including the architecture, canals, gardens, dancers performing the traditional “klompen” in wooden shoes, and artisan cheesemakers and candle carvers plying their trades. Wooden shoe carving, demonstrated several times a day in the village, is absolutely fascinating to watch. The process involves taking a solid block of wood and crafting it into a real, wearable wooden shoe. Kids of all ages will enjoy the petting zoo at the Frisian farmhouse and barn; the Kolean Museum, filled with antique costumes and tulip-farming equipment; Delftware demonstrations, showing how this pottery has been made for 400 years; and the tulip farm exhibit that teaches the 90-year history of the Nelis family’s business. Another big draw in Holland is Lake Michigan and some of the state’s best beaches. If you love a busy beach with lots of people-watching opportunities, start with Holland State Park — a popular destination for folks from all over Michigan. Across the channel is another, smaller beach at Tunnel Park (though it’s still a pretty big beach) that is accessed via a tunnel through the dunes. Tunnel Park is a great place for volleyball, picnics and watching the sunset. Much smaller is Kouw Park, with 200 feet of Lake Michigan beach, picnic areas, a playground and likely far fewer people. If your group wants a little more adventure, you can try Kirk Park, with a third of a mile of beach, hiking trails with an accessible loop, horseshoe pits, a playground, an overlook deck and picnic areas. One more option that’s out of town is Laketown Beach, with a wooden stairway over the dunes and some amazing views of the lake. There is even lots to do in Holland that isn’t Dutch, including the Girlfriends Weekend and the St. Patrick’s Day Parade in March, the Latin America United for Progress Fiesta in May, the “Remember When” Vintage Car Show & Cruise in June, the Tulipanes Latino Art and Film Festival, and the Van Raalte Farm Civil War Muster, both in September. And if you’re visiting over national holidays, like Memorial Day or Labor Day, you can expect a great parade. At Christmastime there is a whole holiday agenda filled with shopping, markets, caroling, Santa Claus, and much more. So head to Holland and your group will have a hard time choosing from all the options. 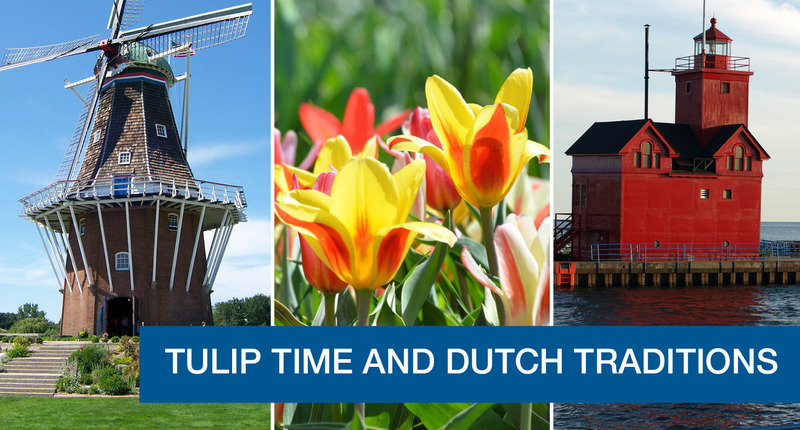 Whether you want to do everything or just soak up the summer sun, your group will have a fabulous time in Holland. Get even more ideas for great group trips in our blog, "Your Dream Trip: Destinations in Michigan. "To make sure your trip is great, download our “Complete Guide to Booking a Bus,” for some helpful, useful information.